It had been ten hours, four films and two meals since roaring down the runway at Heathrow airport. We’d flown over the Atlantic, crossed through the skies above Newfoundland and the white Canadian landscape. I’ve driven for ten hours, maybe even twelve hours on a drive down to Brittany, France, but flying for ten hours was a new concept. I say ten hours but it really didn’t feel that long. I guess it may have been the anticipation, the excitement building up, “I’m going to be in America”. As mundane or as familiar as that might sound, to me this was a completely new. With the immigration paperwork completed on my mini tray table we were ready. Ready for the Land of Hope & Glory. As we disembarked the Virgin Flight at LAX, the late afternoon sun was golden. That warm glow that lights up a landscape, when the sun is thinking about setting but just hasn’t yet decided to go through with it, that lingering orange wash streamed through the windows as we made our way to passport control. At this point, the overarching memory of the next 15 minutes was… the guns. Guns were everywhere. Being a Brit, we’re not in a culture where guns are an everyday occurrence. It wasn’t scary, it wasn’t threatening seeing guns on the belt of every airport official, it was just… unusual I suppose. The interesting thing is that I don’t think I felt safer due to the presence of arms. If anything it was just a sign of the culture and country norms that we were guests of for the next few hours. Our Los Angeles visit was a brief transfer, a small stop on a longer journey, so our bags were dropped off with LAX authorities and we rose up to street level through a couple of empty corridors. We walked past a security desk and three metres ahead of us was the doorway to the USA. The Sunshine Coast lay in wait, just seconds away. We stepped out onto American soil and a LAPD cop pulled up to the terminal on a Harley-Davidson Softail, it was fantastic. I don’t own a Harley, but I’ve test ridden them in the UK and I loved it. So to walk out of LAX and the first thing I see is the iconic cop cruising up on a Softail really made my day. The stopover wasn’t long enough to start exploring the city, so we decided to hail a cab and take a drive around our locality, get a flavour of the city that lay around us. Driving down the freeway toward Santa Monica provided a thin slice of Los Angeles. I find that you can discover a lot about a city by its freeways or motorways. Everyone has to take journeys, everyone is on the way to somewhere. There are those with a plan, with a destination, there are also those that don’t have their destination secured quite yet; but everyone was going somewhere. The freeway has no prejudice over vehicle type or size or colour and in that respect it is a good way to get a glimpse of the people in L.A. All from different backgrounds, different subcultures, worlds within worlds and it was colourful, it was thought provoking, it was brilliant. Moving through L.A.’s criss-crossed blocks, perfectly laid out in this corner of California, I get the distinct impression that life here could be so slow. Each block ticks past like steady hands on a clock. No rush, no panic. I suppose there are Angelenos that can ‘take it easy’ and yet there are others who have to buzz about the city all day long, I think L.A. gives you permission to do either. It gives provision for you to do either and it goes about it in a stylish way, of course. As time continued to slip through the 4 hour hole that we had, we were on our return journey to LAX for our next flight. Lincoln Boulevard was our route as the Friday evening traffic began to mount. Six lanes each way on the freeway, so Lincoln was a good alternative, lined with eateries and nail bars, I means dozens of nail bars. A few taco houses later we were nearing the large metallic three letter structure that signalled the boundary of the airport. Jumping into a cab was a great way of getting a peak at the famous streets of L.A. The short time spent exploring will need to be extended at some point. One afternoon was not enough. 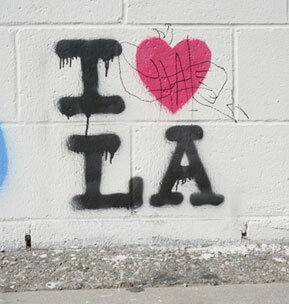 I made a decision that day, my wife and I would have to return and give The City of Angels the time it deserved. Meanwhile, in three hours’ time there would be a plane to board, bound for Aotearoa. To you and I… New Zealand – The Land of the Long White Cloud. PreviousA ‘Flet Wyte’ did you say? !